PixelFLEX will host a West Coast Open House designed to showcase of its line of LED technologies. 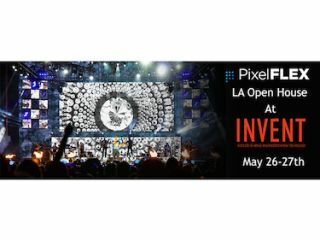 Highlighted by the FLEXLite Plus, FLEXLite NXG, reFLEXion, trueFLEX, and FLEXCurtain HD, the open house will take place at INVENT (Institute of Venue and Entertainment Technology) in Los Angeles, CA, on May 26-27, 2016. The event is free and open to all video designers, integrators, and production rental houses throughout the area who may be interested in taking an in-depth look into the latest in LED video technology. INVENT is located at 1401 East 3rd Street, Los Angeles, CA 90033, and the Open House will take place on May 26 from 1-7p.m., and on May 27 from 10a.m.-6p.m. Through a relaxed and engaging environment, the event will feature complimentary food and beverages, and no appointment is necessary.